Sam Lyomoki (centre) addresses journalists about the impending bill. Looking on is John Baptist Nambeshe (left) and Patrick Nsamba (right). Photo by Vincent Kasozi. 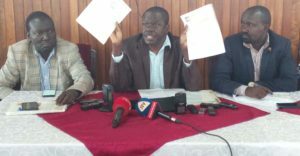 NRM MPs opposed to the deletion of the presidential age limit have resolved to flood the floor of parliament with an avalanche of private member bills on constitutional amendments. One of those bills is meant to ensure a peaceful handover of power by President Museveni. “That will cater for his retirement so that no one pursues him, peacefully.” Sam Lyomoki workers MP announced. The move to table several bills they say will expose the hypocrisy of their own party which chose to support Hon. Raphael Magyezi’s bill to lift the presidential age limit. The MPs say the move by the party caucus to support Magyezi was borne out of a selfish need to entrench President Yoweri Museveni in power. Magyezi was expected to table a motion yesterday seeking leave to draft the bill but the matter was deferred by the speaker. The MPs addressed the press today on their next steps following the drama that played out on the floor of the house and the rest of the country as tension mounted over Magyezi’s expected motion. Present was Sam Lyomoki, Monica Amoding Kumi woman MP, Patrick Nsamba Kassanda North MP, John Baptist Nambeshe Manjiya county MP and Theodore Sekikubo Lwmiyaga county MP. They say they will table motion after motion on their own intentions to amend the constitution including the call for a constitutional review commission which they deem more important than dwelling on age limits, they claim this will pose a challenge to the NRM government which will be seen to be favoring the extension of Museveni’s rule if it declines to listen to all its party members. True to their word the MPs displayed proof of two motions already filed with the office of the speaker, one of those is a motion seeking leave to draft a bill that will ensure president Museveni’s safe exit. Sam Lyomoki the mover of the motion told the press that the bill is called the Museveni succession, transition and immunities bill 2017. “We want to see if they will call a cabinet meeting and endorse my bill because I’m also a member of the movement.” He added. Patrick Nsamba says the move is to convince the speaker that any matter to do with constitutional amendments must wait for a constitutional review commission to be put in place. “You will hear thousands of private members bills being fronted before the speaker, all intended to tell the speaker that we are not comfortable with you dealing with private members bills in terms of constitutional amendments, we want a constitutional review commission,” he stated. The MPs claim that the lifting of age limits has never been discussed by the top organs of the party and the decision to support Magyezi’s motion is not the position of the party. “Why is it that the NRM caucus has decided to decide on such a matter without involving even the other party structures, CEC, NEC and all the other district structures have never sat to agree on such a matter.” Monica Amoding wondered. Monica asserts that those opposed to the lifting of age limits are far greater noting that only less than 200 NRM MPs voted for Magyez’s motion, Nankabirwa is on record as saying 287 MPs voted in favor of lifting of the age limit. Ruth Nankabirwa in response to the proposed flood of private members bills said that members of parliament have the right to be heard and any member with a motion has to be given opportunity to present it so that the house can vote on it. She condemned the move by some MPs seeking to prevent any member form presenting a motion especially the now controversial age limit motion by Raphael Magyezi. “How shall we know what Patrick wants when he’s not given opportunity to say it how shall we know what Raphael wants when he is being gagged from speaking its ‘uncivilisation’ of the highest degree. She retorted.